I recommend using Netregistry.com.au for .com.au domains and GoDaddy.com for .com domains. Both of these companies allow you to call them and discuss problems. Avoid them - recently I wasted 8 hours after discovering a domain reseller had not sent my client a renewal notice. Phone calls bounced back and forth from the reseller and the wholesaler. The reseller sent my client a password that didn't work and the wholesaler said they can do nothing as it was up to the reseller. A common strategy for businesses is to buy up masses of domains - however SEO techniques that use the domain name with keywords in it are not as effective as they previously were. Also for local results Google Places prevents a purely domain buying technique from being effective. In fact having masses of domain names could just be a waste of money unless you do this to prevent a domain name being available to others. 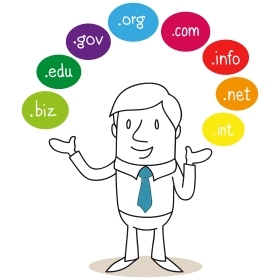 However if you do come up with a good web idea the first step is to reserve the domain name(s). It is important to be comfortable with the actual name you choose because you may be saying this name quite often. In Australia .com.au domains are slightly more effective than .com names however you can get to the top of Google with either in Australia. It is very important that the structure of your site is effective rather than just a domain name with keywords in it. An effective structure and an effective design will naturally gain you good traffic from Google. Make sure you or your company are listed as the registrant of your domain name. Don't allow anyone to buy a domain name on your behalf unless you trust them to put it in your name. I have seen examples where 'marketing' people place the domain name in their own name for prospective clients. This can only lead to problems later especially in Australia which has a stricter change of registrant procedure for .au names. Essentially once these are setup your site on that server is live. Email can be setup via the host or setup seperately - hence you can use one hosting company to host your site and you can also have your own private email server if need be or a seperate host for the email.